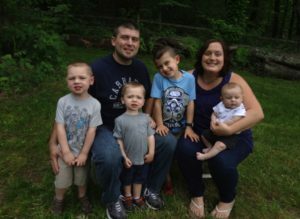 Andrew and I decided that we wanted to foster, with hopes of adopting, when we were told the only way we could have more children was through in-vitro fertilization. We were thankful to have our son Tyler, but knew we could provide a safe place for children in foster care who needed a home. During that time, we had church friends who were involved with KidsPeace Foster Care and we were able to see the impact they made on the children’s lives. We wanted to be a part of that and wanted to welcome children into our home as our own. After completing our training and approvals, we signed our contract with KidsPeace around noon on October 31, 2014, and Evan and Kayden were at our house at 7p.m. We knew from the moment they came into our home that they fit in perfectly. They became a part of our family immediately. In July, after nine months of the boys being a part of our family, they were reunified with their Mom. We drove the boys to their house and unloaded the car with all of their boxes of toys and clothes. They accumulated a lot of stuff because they celebrated Christmas and birthdays with us. As hard as the drop-off was, I was thankful Tyler was able to see where the boys were going to live. Before we left, I hugged their Mom and she thanked us for everything we did for her and the boys. 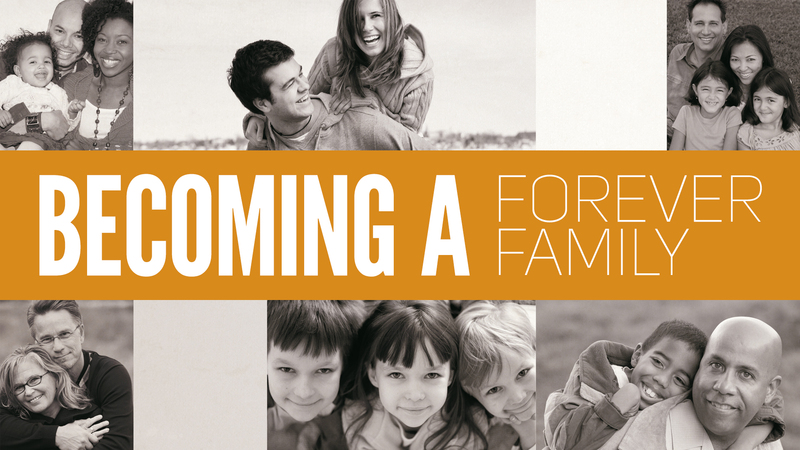 We kept reminding ourselves that this is the purpose of foster care – to have the biological parents better themselves and for the family to be reunited. We took a short break from foster care so we could process our empty house and spend some one-on-one time with Tyler. After a couple of weeks passed we received a referral for two girls. The girls were only at our house for two weeks when we received a phone call from KidsPeace saying Evan and Kayden were coming back into care. After many discussions, KidsPeace was able to find a family for the girls so we could get the boys back. 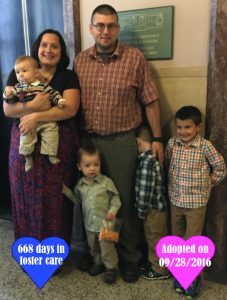 This time we were told the case would go right to adoption once the appropriate time passed. Evan and Kayden made themselves right at home, as if they’d never left. Although we had to work through some adjustment issues in the first month or so, our family felt complete again. Foster care is such an emotional roller coaster ride. Kids come into your life, sometimes they go home, other times they don’t. There are visitations with bio-parents, doctor appointments, court hearings, developmental tests, and therapy. We are thankful to have KidsPeace walk along with us through our journey. They were such a support whenever we needed anything.